Big news from Billboard is that our official Latin emissary to the pop world, the “Despacito” of Fonsi, Yankee, & Bieber (LLC), has a new notch to add to its chart belt. Billboard notes that Fonsi’s “Despacito” is not only swamping both Top 40 and Latin airplay, it’s selling and streaming the pants off every other Spanish-language song you care to name. This works out well for other, similar sounding songs. When you play “Despacito” on YouTube, the video channel helpfully chases it with another variation on “Despacito”‘s dembow rhythm — for instance, CNCO’s “Reggaeton Lento,” Maluma’s “Felices los 4,” or Shakira’s “Chantaje,” in whose video Shakira goes HAM by walking a pig through a convenience store. All those ancillary streams give their songs a chart boost. “Despacito” is never followed by Christian Nodal‘s gorgeous mariachi-pop “Adios Amor,” which hung out in the Hot Latin top 10 for the first half of the year, or any other regional Mexican song. This is one way the club sound reinforces itself. Also worth noting in the above-linked article: halfway through 2017, there’s only one regional Mexican album in the cumulative Latin top 10, and it comes not from perennial album seller Gerardo Ortiz, whose very good Comeré Callado Vol. 1 seems to be stiffing. Rather, this year’s biggest Mexican album is the (not quite as good) 2016 album from teen sierreño sensations Ulices Chaidez y Sus Plebes. Under Billboard‘s current album accounting methods, Chaidez’s “album sales” have risen thanks to online streams of his hit ballad “Te Regalo,” which peaked at #12 and charted for half a year. Ortiz could use his own big single to boost his Equivalent Album Units, but right now his lame sierreño pop “Para Que Lastimarme” is falling from a #15 peak. It’s looking more like Ortiz’s 2015 album Hoy Más Fuerte was, in fact, his New Jersey: “a huge event album that ultimately feels a bit hollow and signals a career decline” (at least in commercial terms). This is something NorteñoBlog totally called; although in fairness, if it proves untrue, I probably won’t retract it. I’ll be sure to consult my journalistic ethics team. In short, regional Mexican music seems to be going through some summer doldrums, a period of relative unpopularity compared to other Spanish-language music. Its central star, Ortiz, is using a hot sound, sierreño, but his new music is struggling to catch on. Nodal, the singer of the format’s biggest 2017 hit, has yet to release an album. The popularity of “Despacito” is benefitting other songs with more club-oriented electro rhythms. And I haven’t even mentioned that our biggest norteño song, Calibre 50‘s “Las Ultras” (#17 Hot Latin, #1 airplay), is a beer jingle. For light beer. Plenty of blame to go around. Much has changed on the Mexican airwaves since NorteñoBlog last tuned in over a month ago. The former #1 song, a heartbroken sob story of romantic grief and brassy bereftitude by Arrolladora, has given way to a different heartbroken sob story of romantic grief and brassy bereftitude, this time by Banda MS. And everyone knows that Arrolladora ballads are ace slow jams with rhythm sections full of coiled tension, while MS ballads drip like the discharge from festering sores. It’s all there in the music! Further down, two Remex Records acts have replaced themselves on the radio with remakes. The more notable is ace flarer-of-nostrils Edwin Luna and his banda of second fiddlers, La Trakalosa. Given our troubled and uncertain times on both sides of the Great Wall of Trump, NorteñoBlog finds comfort in watching Luna grimace his way through another extravagant video meant to highlight his perennially nascent acting chops. (He acts in both color and black and white!) No hay nada nuevo bajo el sol. “Dos Monedas” was previously a hit for Ramón Ayala, and it was written by Jesse Armenta — You know him! He wrote some political barnburners for Los Tigres, including “El Circo,” thus winning himself a chapter in the book Narcocorrido — and it’s another heartbroken sob story. Their distance from the majors doesn’t seem to have hurt them. Remex bands are all over the radio and their YouTube counts sometimes resemble the budgets for Avengers movies. The one place Remex bands tend to go missing is the award show circuit, which behind all the pyrotechnics and back slapping remains a shadowy cabal of major label machinations. Although flagship banda La Trakalosa de Monterrey has shown up at the Premios de la Radio, Remex bands have rarely if ever played the Latin Grammys, probably because it would cost the label $40-to-$100,000 to send one of their acts to perform. But who cares about some dumb award when, like Joe-C, you’re down with the devil? This week’s new or newish releases are motley and middling, sort of like the white elephant prize table at the office Christmas party. When we encountered Alfredito last week, we were hearing his song “Con La Novedad” covered by Banda Rancho Viejo. It’s possible this album won’t actually be released until January, per Amazon, but it’s also possible the whole thing’s currently up on Youtube, what with the Sony corporation’s attentions somewhat diverted these days. Olivas is a distinctive and “ito”-faced corridista and romantic who works with both a banda and a small group. He had a couple tracks on Hyphy’s El Corrido VIP comp. Now here’s something you don’t see every day: a Tejano band releasing an album of George Strait covers. Interesting, eh? In theory, at least. From what I’ve heard, these songs are less interesting than Strait’s own cover of José Alfredo Jiménez, “El Rey,” which may deserve its own thesis. A fairly nothing ballad with some nice close harmonies. Their padrino el diablo made them do it. Easily the most interesting person on this list, Vargas was a highly dramatic singer of ranchera torch songs, a movie actor, and a lesbian who came out late in life. Here’s a thesis to read! 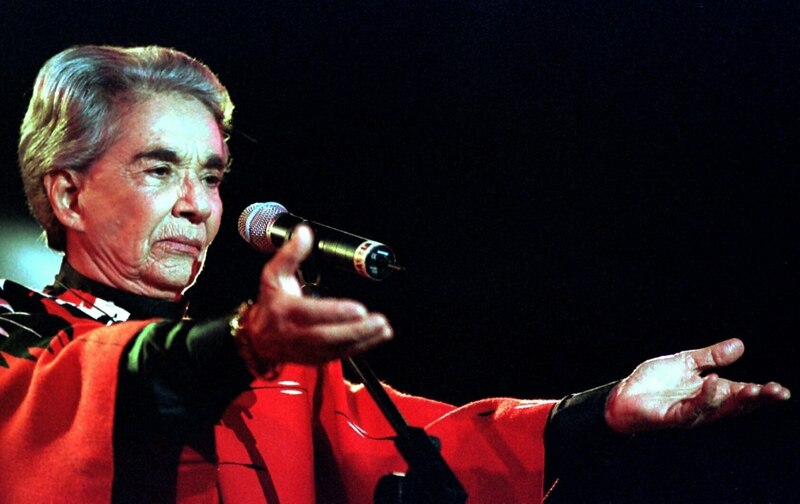 Like “El Rey,” this collection’s title song was written by José Alfredo Jiménez.